With sharp knife or mandolin, slice zucchini and onions; place on large bowl. Sprinkle 1 tablespoon salt over vegetables. Cover with plastic wrap; refrigerate at least 1 hour or up to 8 hours. Heat oven to 350°F. Unroll pie crust in bottom of 11-inch quiche dish; press in bottom and up side of dish. Set aside. Remove vegetables from refrigerator; squeeze out excess liquid. (Squeeze with hands or press with back of spoon with vegetables in strainer.) 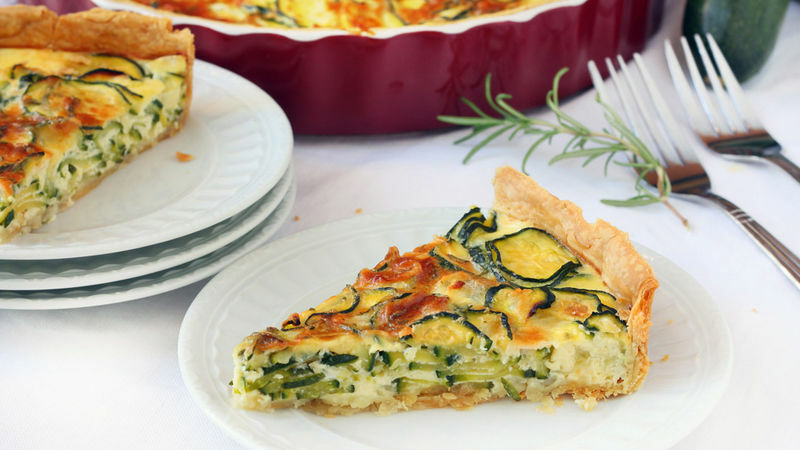 Arrange vegetable slices in quiche dish. In separate medium bowl, lightly beat eggs, milk, cheese and rosemary. Season to taste with salt and pepper. Pour over zucchini slices. Bake 45 minutes or until top is light golden brown. Cool slightly before serving. Store in refrigerator. Zucchini has high water content so it's very important to sprinkle salt over the zucchini slices and let rest for at least 1 hour. During this time the salt draws out the water from the zucchini, preventing the pie from becoming watery. If you do not have any rosemary on hand, other herbs that pair well with zucchini are basil, sage and oregano.